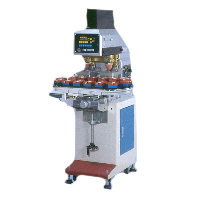 Two Color Pad Printing Machine (With 14 Stations Conveyor)(WE-152A) - Guger Industries Co., Ltd.
A durable and trouble free both Germany made “BOSCH” and Japan made "SMC" quality pneumatic components and bearing have been adopted and used on the machine. An individual air cylinder is used on rotary conveyor table for precise positioning. An optional hot air equipment for quality printing is suggested and recommended (On request).